Sophia Miller handles the ball. The junior back and the rest of No. 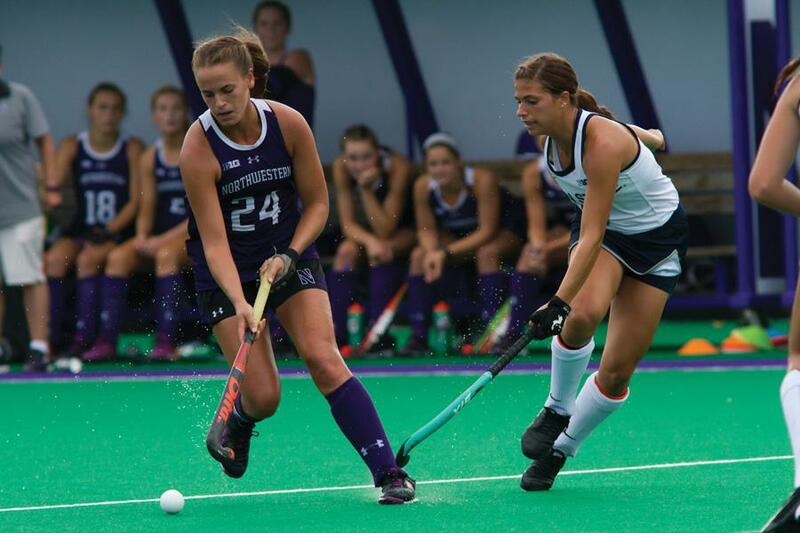 6 Northwestern will look to avoid a letdown this weekend after knocking off two top-ten teams in their last two matches. The opponents don’t have lofty numbers in front of their names, but Northwestern remains just as focused. A week after making a national statement by defeating two top-10 Big Ten teams at home, the No. 6 Wildcats (8-2, 3-0 Big Ten) are keeping their intensity level high ahead of road matches at less-heralded Rutgers (6-3, 1-1) on Friday and Drexel (5-5) on Sunday. On paper, neither the Scarlet Knights nor the Dragons are as accomplished as NU. Rutgers lost to unranked Indiana last week. Though, to their credit, they beat No. 18 Iowa on Sunday and took then-No. 5 Virginia to overtime early in the season. Drexel, meanwhile, allowed seven goals to then-No. 3 Connecticut in early September and has lost two of its last three games, all against unranked opponents. The Dragons have just one home win this year. The Cats, however, aren’t taking their opposition lightly. Nonetheless, NU has been ruthless against lesser competition so far this season. The Cats defeated unranked Ohio State 5-1 in the Big Ten opener and scored at least five goals on three occasions in non-conference play. NU’s most lopsided game was an 8-0 win against Colgate, in which the Cats held a whopping 46-1 edge in total shots. NU is also on a roll, winning its last six games. After losing their season opener, the Cats have gone 8-1 and defeated three top-10 teams, which sophomore forward Eva van Agt said only adds to the team’s belief in itself. “Now that we beat those two good teams, we are getting way more confidence than at the beginning of the year,” van Agt said of Penn State and Maryland. Throughout the season, the Cats have stressed their “one game at a time” mentality. Because of that, NU feels that it still has significant work left to do despite last weekend’s wins. Another top-10 home clash against No. 9 Michigan lurks in late October, and November’s Big Ten Tournament is another pivotal point in the season. In the meantime, the Cats have turned their full attention to the Scarlet Knights. Especially after last week’s wins, NU has high expectations for the rest of its season. Despite that, von der Luft brushed aside the notion that the Cats struggled to refocus.